The Financial District of Manhattan is a vast, sprawling area that runs west from Brooklyn Bridge to the World Trade Center then straight down to Battery Park and the New York Harbor. A heaving architectural free-for-all that arrogantly ignores the newer and more disciplined ‘grid’ system of streets and avenues to the north of it. Huge brick and steel monuments to success and power dominate every corner increasing in size and engineered glory the closer you get to Wall Street, and the heart of this district. Love or hate its symbolism, fear or embrace its dynamic of winner and loser, it is the proud and (slightly) tarnished monolith that the city was built around. If you can forget all that it stands for and are capable of just breathing in the sheer magnificence of its skyline without questioning the pros and cons of its existence, then just before the sun sinks into New Jersey, the view from Brooklyn Bridge Park over the East River is simply awe inspiring. East side of the tip of Manhattan, from Brooklyn Bridge Park. You should, at least once. Thank you for the comment. On a warm summer night it is the best view. Thanks. These photos are so vivid, I almost feel like I was standing next to you when you took them. Touching and beautiful. Thank you, incredible that we create our own reality. Now that you have said that, it does now seem like you were standing right next to me. Touching and beautiful indeed. It sure is! Exciting, dynamic shot! I love it. It is now my desktop background. Thanks for the comment. Well, I couldn’t think of a more evocative shot of your adopted city! That IS a gorgeous photo!!!!!!!!!!!! Great Shot, I love the colors. this sure is a gorgeous picture. i can imagine standing there looking out into that vision. 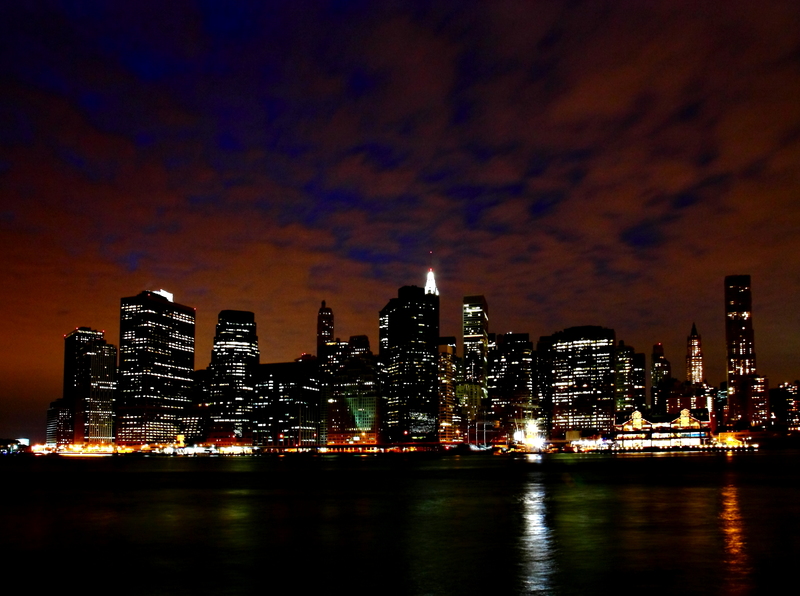 Brooklyn Bridge Park is a great place to see Manhattan from, especially at night. Thanks for the comment. Great. The sky makes the silhouette stand out. What was your exposure? The exposure was 10 seconds with the aperture set to 9.0 @ ISO 100 with the white balance set to daylight to give it that warm glow. Pleased you liked it. Thanks for the comment. Thanks, it is a great view from Brooklyn.